ALBA essay prize winners bring fresh research to the issues of the Spanish Civil War. In the undergraduate category, Fletcher Warren, a student at Bethel University in Saint Paul, wrote about the 60 Minnesotans who volunteered to fight fascism in Spain. His essay (full text here) explores the lives of three men in particular: Benjamin Gardner, Clarence Forester, and George Zlatovski. The graduate winner is Ashley Ellington, a Master’s candidate in History at Georgia Southern University. Ellington writes about “conflict archeology,” focusing on the exhumations of the remains of Republicans found in mass graves from the era of Spanish Civil War and the Franco dictatorship (full text here). While Ellington covers the various polemics about contemporary exhumations, she moves into terrain that is normally not connected to the disinterment of Republican victims: the uncovering of ammunitions in archeological sites of the Civil War, including the battle for Madrid. Ellington shows how archeologists in Spain conduct battlefield surveys and carry out conservation work that seeks to understand “the complexities of entire landscapes altered by war.” The essay concludes with a look at a third area of interest to archeologists in Spain: the labor camp. Ellington discusses what kinds of artifacts have been uncovered in the Francoist labor camps that held Republican solider and civilian captives. These artifacts, mainly tin cans and materials to relieve boredom (like inkwells and dominos) help researchers piece together conditions of everyday life in the camps—at least before the prisoners were sent off to forced labor battalions or shot by firing squad. The annual George Watt Memorial Essay Prizes award excellence in student writing about any aspect of the Spanish Civil War, the global political or cultural struggles against fascism in the 1920s and 1930s, or the lifetime histories and contributions of the Americans who fought in support of the Spanish Republic. The award—given to an undergraduate and graduate paper–was established 13 years ago to honor the memory of Lincoln vet George Watt (1914-1994), a social worker, writer, and lifelong activist central to the creation of ALBA. 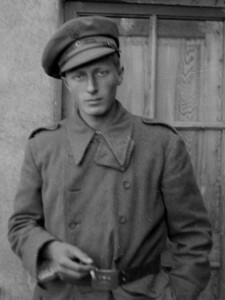 Before the Francoist coup in Spain, Watt had been involved in Communist youth activities, and in 1937, at the age of 23, joined the Abraham Lincoln Brigade. Watt’s also served in World War II. After his plane went down over Flanders in 1943, Watt survived with the help of the Comet Line, an underground organization active in Belgium and France. This year’s jury, consisting of Josh Goode (Claremont Graduate University), Mónica Cantero (Drew University), and Gina Herrmann (University of Oregon) received 20 essays; seven essays from graduate students and 13 from undergraduates. As in past years, the jury was pleased to find submissions from the US and abroad, and remarked on the high quality of research coming from Spain. Among the undergraduate essays, students addressed a variety of themes that speak to ALBA’s mission and Watt’s legacy, including studies on poetry written by political prisoners during the Franco dictatorship, the political commitments of Picasso, British diplomatic responses to the civil war, and the exile of Spanish children during the conflict. Among the graduate submissions, topics included a study about what motivated men and women to enlist in the Abraham Lincoln Brigade, the Francoist blockade of the Basque region, and counterrevolutionary discourse during the Second Republic and the Civil War. Read more about Ashley Ellington’s essay here, and about Fletcher Warren’s essay here. Gina Herrmann teaches at the University of Oregon and is a member of ALBA’s board.